An unfortunate side effect of pregnancy is more yeast infections, and whether you're treated orally or by suppository could matter to your unborn baby. One of the more unfortunate side effects of pregnancy is more yeast infections. Although most can be treated with an over-the-counter, topical yeast infection medication, occasionally an oral drug called fluconazole, known by the brand name Diflucan, may be prescribed by a doctor. But a new study published in The Journal of the American Medical Association (JAMA) is lending support to long-standing concerns that the med may not be safe during pregnancy. Researchers looked at over 1.4 million pregnancies in Denmark over a 17-year period. The 3,315 pregnant women who were treated with fluconazole were 50 percent more likely to have had a miscarriage than women who were not exposed to the drug. "Use of the oral antifungal medication fluconazole during pregnancy was associated with an increased risk of [miscarriage] compared with risk among unexposed women," study author Ditte Molgaard-Nielsen, M.Sc., of the Statens Serum Institut in Copenhagen, tells Fit Pregnancy. But just because the drug appears to be linked with miscarriages, doesn't actually mean it's causing them. "This is in fact an observational study of the association, or correlation, between use of oral fluconazole in pregnancy and the risk of [miscarriage], so no definitive conclusions can be made about cause and effect," Molgaard-Nielsen says. "It is possible that fluconazole-treated women differ from untreated women in ways that are associated with an increased risk, and for which we have not been able to account for—for example, the severity of the vaginal yeast infection." The first line of treatment for yeast infections is usually a vaginal suppository like Monistat. But, "some pregnant women receive oral treatment with fluconazole in cases of recurrence, severe symptoms, or when topical treatment fails," Molgaard-Nielsen says. So, it could be that some underlying factor present with a severe yeast infection increases the miscarriage risk, not the drug used to treat it. Even so, fluconazole has come under fire before. In 2011, the U.S. Food and Drug Administration (FDA) changed the classification for the drug from category C to category D, which means that they determined there was a risk to human babies. The evidence had to do with the effects of high-dose, long-term use of the medication on the chances of birth defects, so the FDA didn't think that the low-dose amount used to treat vaginal yeast infections was likely to pose a risk. This current study, though, included women who'd taken low doses, and according to the authors is the largest to date on the effects of the drug on miscarriage rates. Which med should you use? Given that fluconazole is a category D drug, doctors are already cautious about prescribing it to pregnant women, even though yeast infections are common in pregnancy. "Pregnant women are at increased risk of vaginal yeast infection—the prevalence among pregnant women is estimated to be 10 percent in the U.S.," Molgaard-Nielsen says. This is because all the hormonal changes to your body make things ripe for yeast to grow and cause an imbalance. 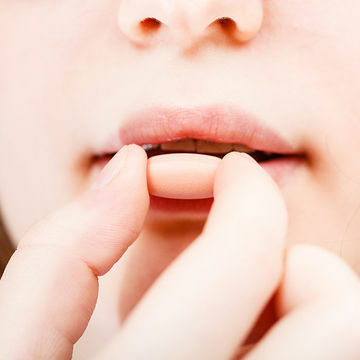 But even if your symptoms seem unbearable, you might want to hold off on requesting the stronger oral medication, and stick to the suppositories. Whichever med you choose, any yeast infection during pregnancy should be checked out by a doctor. "Our findings warrant further studies before we can say whether treatment with oral fluconazole poses a safety issue," Molgaard-Nielsen says. "However, until more data on this association is available, cautious prescribing of oral fluconazole may be advisable. So our results support the recommendation of being restrictive with oral fluconazole and use local treatment as the first choice."